Chemically dependent pregnant and postpartum women not only face the shame of their own unhealthy choices but the guilt of inflicting the damage of addiction on their children. What treatments have helped? Lissi Seneway, MS, smiles when she looks at a photo she received from a former patient. It shows a healthy, beaming 8-month-old baby standing in a crib with arms outstretched in a good-morning welcome for mommy. It’s the kind of blissful moment that most mothers cherish but one that Seneway’s patient may never have experienced if not for the Mothers and Infants in Treatment Together (MITT) program at West Palm Beach, FL’s Gratitude House, a treatment center for chemically dependent women. MITT is a six- to nine-month program that accepts women with babies up to 6 months of age. Determined that she could be a successful mother, the Gratitude House staff devised a plan tailored to her needs. They temporarily returned the babies to foster care, brought in a parenting coach for one-on-one instruction with the patient, and then scheduled manageable visits—first one night, then a day and night, and then a weekend—until the mom was caring for the infants full time. Now 31, the woman has returned to school and a productive life with her daughters. “She changes their diapers, feeds them, and does whatever else she is doing without batting an eye,” says Seneway, former clinical director of Gratitude House and a founder of MITT who currently has a private practice in Delray Beach, FL. 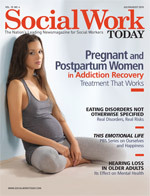 An individualized program and flexibility are among the top recommendations of the professionals interviewed by Social Work Today for treating pregnant or postpartum women addicted to alcohol or other drugs. The length of treatment at each facility varies based on a woman’s particular needs. Take, for instance, Serenity Place, the 16-bed residential program for pregnant and postpartum women and their children up to the age of 5 at The Phoenix Center, a drug-and-alcohol treatment facility in Greenville, SC. Although its treatment program is usually six months long, Serenity Place does what it can, when necessary, to extend treatment for its mainly low-socioeconomic, Medicaid-dependent clientele. A program can be adapted for an expectant mother’s physical symptoms. If her ankles are swollen, she’s nauseated, or she needs to nap, some facilities will allow her to lie down during group sessions, while others will arrange for counseling to take place in her room or will bring her up-to-date later on information that was presented at a lecture that she missed. Life skills are taught and practiced regularly in most facilities. Patients cook, clean, manage the “household” (or living space), and complete other chores. For postpartum patients, of course, caring for baby takes precedence over other activities. In any case, patients are generally “not kicking back, watching TV, and drinking soda,” says Janet A. Castellini, MSS, LCSW, primary therapist at Seabrook House in New Jersey, which operates MaterLiber (“mother-child”), a 28- to 35-day residential chemical-dependency treatment program for women and their children up to the age of 4. Seabrook House, which has another facility in Westfield, PA, previously operated a six-month to one-year mommy-and-me residential program known as MatriArk (“mother safe harbor”), but the program is now defunct due to lack of funding. Education is a large part of treatment in all of the programs for pregnant or postpartum women with addictions and, depending on the facility, can run the gamut from instruction on prenatal and postnatal care, child development, and fetal alcohol syndrome to smoking cessation, sexually transmitted diseases, HIV, and hepatitis C. At Gratitude House, a social worker from the county jail regularly offers presentations that ease patients’ minds by portraying members of law enforcement as friends rather than foes. As would be expected, all of the facilities either use staff or bring in outside agencies to teach parenting classes and instruct patients regarding nurturing a baby. A special concern is the fact that pregnant women should not take certain psychotropic and other medications. Among those who stress the need for alternative and holistic treatments is Becky Flood, MHS, LCADC, NCACII, BRI II, executive director and CEO of New Directions for Women in Costa Mesa, CA. A 24-bed residential chemical-addiction treatment center that accepts pregnant and postpartum patients with children up to the age of 12 for 30 days to one year, New Directions for Women employs alternative treatments such as mindful meditation, guided imagery, and natural supplements. At Gratitude House, myriad specialty groups include those for body issues as well as those for grief and loss, forgiveness, and families. Among the many “firsts” listed on its website—including the first to open a women’s-only treatment center (1968), the first to treat pregnant and postpartum women (1989), the first to offer an intensive day-treatment program for women (1992), and the first to implement an integrated HIV/AIDS chemical dependency program (1995)—Gratitude House maintains that it is the first to integrate an on-site job coach/vocational counseling program (2007). Clients who have no résumé or little educational and/or work background practice cash register and customer service skills at a thrift store recently opened on Gratitude House’s campus. Experts also stress that those providing counseling and administering treatment be nonjudgmental, especially because women who are addicted and pregnant face severe social stigma. Castellini notes that a single, pregnant woman who has previously lost a child to the child welfare system can be marginalized and regarded as a difficult patient. Psychosocial issues among pregnant women with addiction can be compounded and include guilt, remorse, shame, embarrassment, denial, anger, and loneliness. There’s fear not only that the baby will be born addicted or with other physical or mental challenges caused by drug abuse but also a fear of authorities, being arrested, dealing with the legal system, and basics such as health insurance and employability. Just the thought of carrying another living being inside one’s body can be mind boggling and create anxiety-producing for any first-time mother, let alone one who, as a substance abuser, has been running away and covering up emotions and is now battling the urge to use the numbing substance on which she previously relied. Therefore, peer support is essential—more specifically, coming into being as a woman and bonding with other women by talking about the awesome abilities of the female body and the amazing gifts that women experience in conception, pregnancy, and childbirth. Developing relationships with other women is part of what’s known as gender-specific treatment, or treatment specifically designed for women and their special issues. It’s an approach that’s advocated by Flood—who, prior to joining New Directions for Women, cofounded Seabrook House’s former MatriArk program—and Ira Chasnoff, MD, president of Children’s Research Triangle, a community-based organization in Chicago, and a professor of clinical pediatrics at the University of Illinois College of Medicine. Gender-specific treatment, Chasnoff says, focuses on relationships because women’s lives revolve around relationships, and women recover within their context. “Classic drug treatment in the United States has always been focused on the 12-step model, which was originally designed for men,” he says. It urges patients to focus on sobriety, which tends to isolate them from relationships. Many women in addiction have no role model for parenting because their mothers were addicted. In addition, “Ninety percent of drug-using women have had violence in their backgrounds,” says Chasnoff, whose latest book, The Mystery of Risk: Drugs, Alcohol, Pregnancy, and the Vulnerable Child, is slated for publication in September. Gender-specific treatment addresses violence while focusing on a woman’s family history, her early childhood attachments, and her current relationships with other adults. Maternal-fetal attachment therapy, which includes tactics such as teaching a mother to read to her baby before it’s born, is employed to help a mother form a bond with her baby. Also essential to women who are addicted and pregnant or postpartum are aftercare and a connection to community resources, such as prenatal or postnatal services, 12-step programs, and housing, education, and employment services. At Gratitude House, two counselors focus on aftercare, serving all clients regardless of how they exited residential treatment—whether they succeeded, were medically discharged, or went AWOL. A MITT counselor will visit a woman in the hospital, at home or, if she’s employed, during her lunch break. — Nadine M. Hasenecz is a freelance writer living in Bethlehem, PA.
• In 2002 and 2003, 4.3% of pregnant women aged 15 to 44 used illicit drugs during the past month, 4.1% reported binge alcohol use, and 18% reported smoking cigarettes. • Pregnant women aged 15 to 25 were more likely to use illicit drugs and smoke cigarettes during the past month than pregnant women aged 26 to 44.